Oncology, Gastroenterology and Hepatology Reports,2015,4,1,30-31. The omphalomesenteric duct is an embryonic structure which connects the yolk sac to the midgut. The omphalomesenteric duct attenuates between the 5th and 9th week of gestation. 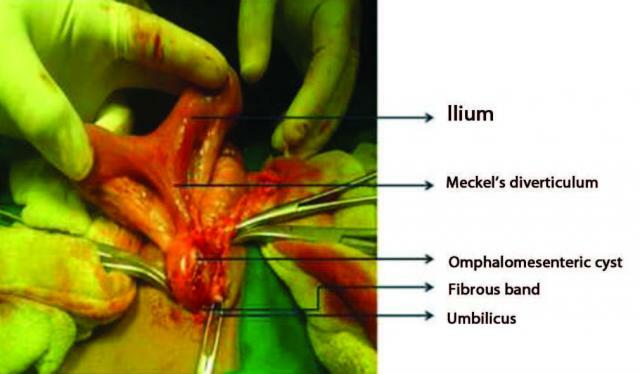 Failure of the omphalomesenteric duct involution, either partial or complete, results in various anomalies including Meckel’s diverticulum, patent vitelline duct, fibrous band, sinus tract, umbilical polyp and cyst. Omphalomesenteric duct remnants are present in 2% of the population. The simultaneous presence of omphalomesenteric cyst, fibrous band and Meckel’s diverticulum is extremely rare. We have an 8‑year‑old child with a history of umbilical polyp and discharge in his infancy now presents with persistent pain abdomen. On laparotomy we found a Meckel’s diverticulum, an omphalomesenteric cyst and fibrous band. Multiple anomalies in the vitello‑intestinal duct though very rare can cause clinical problem which need specific attention in terms of surgery.